The Ayoreo People are the last people south from the Amazon Basin who still have members living in voluntary isolation. They live in the remaining dense semiarid bush and forests of the Chaco. The traditional Ayoreo Territory covers some 300,000 Km2 between Paraguay and Bolivia. They conform a brave warrior people who remained free from colonial exploitation for many centuries. The Ayoreo People used to live unperturbed until the 1930s, although, efforts to forcefully settle them started already in the seventeenth century. Through massive efforts by missionaries from Mennonite and Evangelists religious sects and the Paraguayan Government, they were forced out of their territory and forced to live in confined settlements. At present, this territory is being deforested rampantly to give space to extensive cattle ranching, other forms of agriculture and oil prospection. 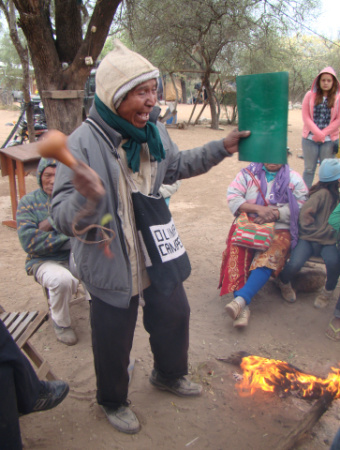 This photo story shows what the Ayoreo people, organized in the UNAP (Union of Native Ayoreo People of Paraguay), are doing to recover their land and dignity, which are, as they say, the essential elements of their territory. The efforts of the Ayoreo People to maintain the environmental and natural attributes of their Indigenous territory are similar to the efforts by numerous other Indigenous Peoples around the world who are aiming to conserve their indigenous territory as an ICCA.